This is a spin-off series to Reece's fantastic 'Last Chance Rescue' series. The LCR elite team rescue victims from some of the most dangerous places in the world. Sabrina Fox is one of these operatives. A former assassin, she is skilled, strong, determined, independent and not afraid to speak her mind. Believing her husband, covert ops agent Declan Steele, to have been killed in an explosion a year ago, she is completely knocked for six when he returns after being held hostage and tortured in a prison camp for all of that time. Their reunion is not the happy ever after you would expect however, as Declan is convinced that his wife is the person who betrayed him and set him up to be kidnapped. The only thing on his mind right now is revenge and killing Sabrina is first on his to do list. Sabrina must convince him of her innocence if they are to have any chance of a future together. Declan must work with the LCR team if he wants to find out what really happened. However, old feelings are hard to ignore and Declan finds himself having to choose between trusting his heart or giving in to his need for retribution. But it may already be too late, as enemies close in, Sabrina is kidnapped and disappears without a trace. It is a nail biting race against time to get her back. 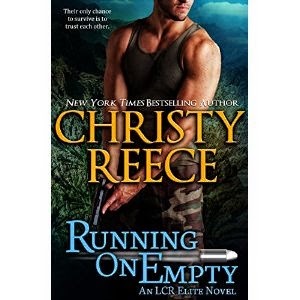 'Running on Empty' is fast paced, action packed from beginning to end and is difficult to put down. As a fan of Reece's 'Last Chance Rescue' novels, I was thrilled when this series was announced and I wasn't disappointed. After this instalment Christy Reece will be staying on my automatic buy list.